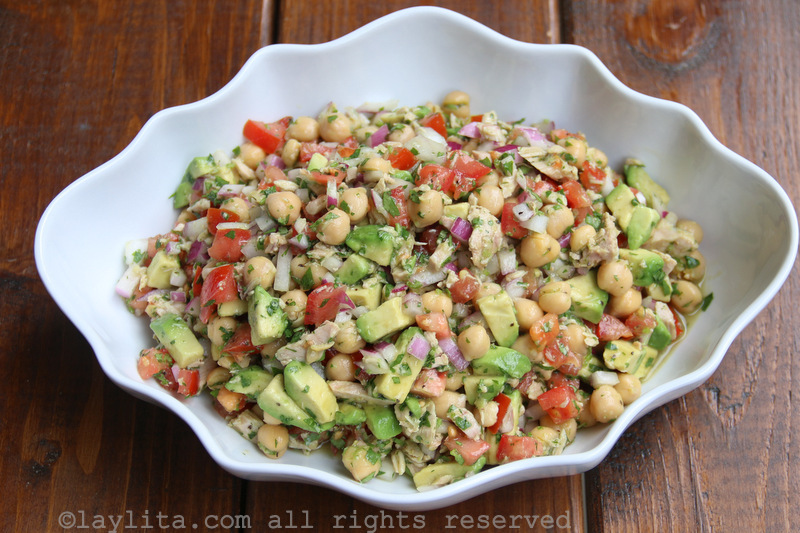 This simple garbanzo or chickpea salad with avocado and tuna fish is one of those quick and delicious dishes that are perfect for a last minute meal but also prepared ahead of time. 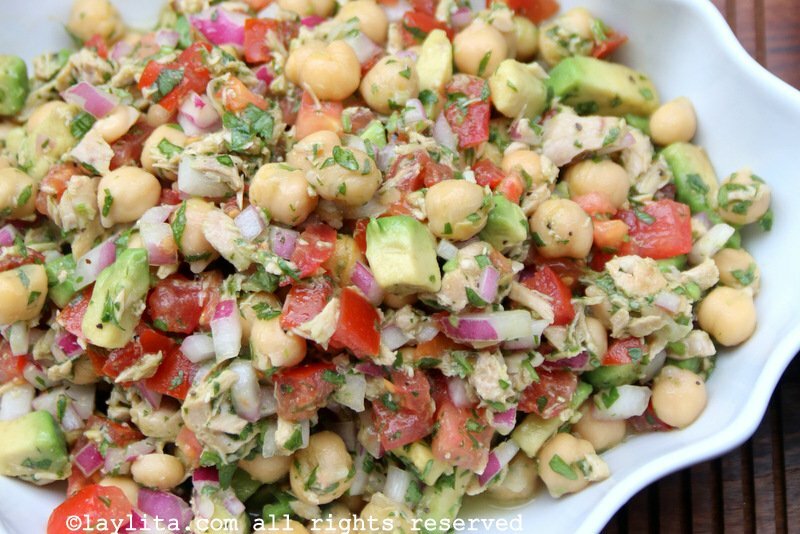 This refreshing salad is made with garbanzo beans or chickpeas, avocado, tuna fish, red onions, tomato, lemon, mustard, olive oil, and cilantro. 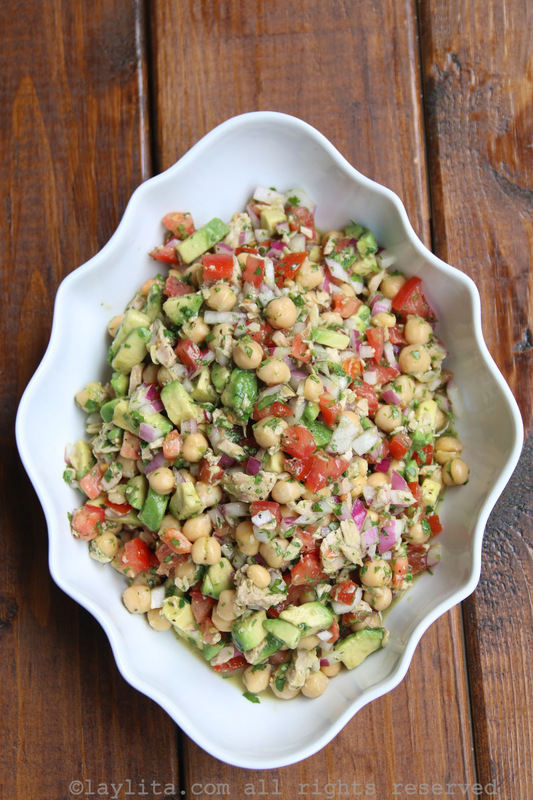 For a vegetarian option, you can leave the tuna fish out of this chickpea salad. You can serve the salad as a starter salad or side dish. You can also place it on top of lettuce leaves. Another delicious option is to serve it as an appetizer with crackers or garlic toast. The salad tastes even better if you prepare it ahead of time and let the flavors marinate before serving, in this case I would recommend adding the avocado right before serving. Feel free to customize it and add additional vegetables and fresh herbs. Simple and delicious chickpea salad with avocado and tuna fish, this quick and refreshing salad is made with garbanzo beans or chickpeas, avocado, tuna fish, red onions, tomato, lemon, mustard, olive oil, and cilantro. Place the lemon juice, olive oil, mustard, cilantro, salt and pepper in a small jar, close tight and shake until the ingredients are well mixed. 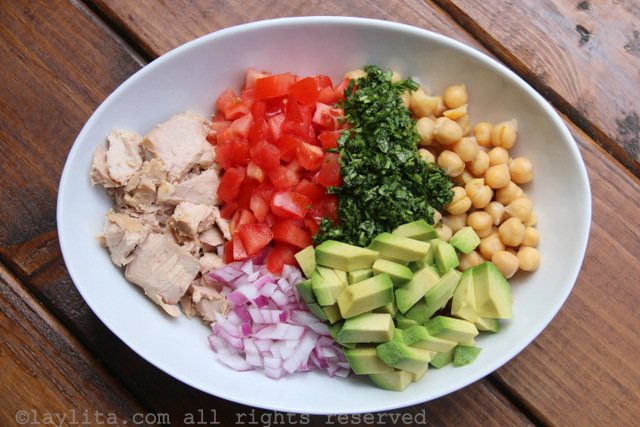 Combine the chickpeas, tuna fish, diced red onion, diced tomatoes, cilantro, and avocado in a large bowl; add the lemon mustard cilantro dressing and mix. The salad can be served immediately or refrigerated until ready to serve – if preparing ahead of time add the diced avocado right before serving. 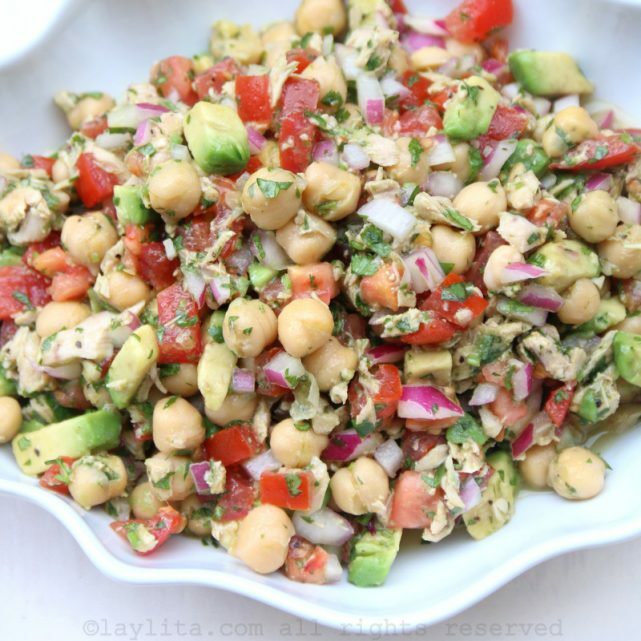 Serve the chickpea avocado salad alone or on top of lettuce leaves. 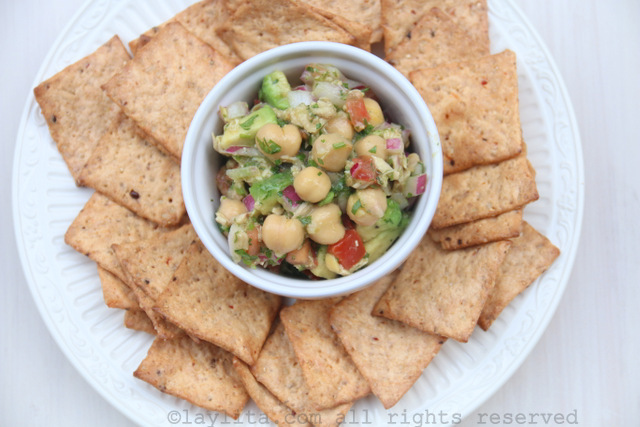 Can also be served as an appetizer dish with crackers/toast. I love this salad, and so does everyone who tastes it! I use grilled chicken since my husband hates canned tuna.